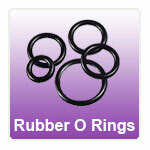 Replacement black rubber O rings used on ear stretching jewellery. These can be used on any of the ear stretching expanders, flesh tunnels and tubes and flesh plugs sold on this website. We also stock the Kaos Software range of decorative O rings. "Exceptional service, great quality goods, really pleased with the whole process and will definitely use again. Thank you jo"